Selling a house privately sounds better than it really is. You trade full marketing exposure for some personal privacy, which is a trade of dubious value for the vast majority of people. Selling a house privately doesn’t even make sense for the rich and famous because luxury homes are much harder to sell, and by default need all the exposure they can get. 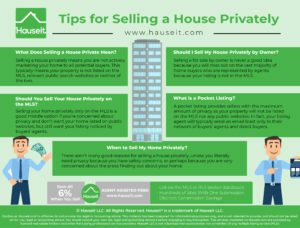 What Does Selling a House Private Mean? Should I Sell My House Privately by Owner? Should You Sell Your House Privately on the MLS? Should You Sell Your Home Privately Through a Pocket Listing? Selling a house privately means you are not actively marketing your home to all potential buyers. This typically means your property is not listed on the MLS, relevant public search websites or neither of the two. Your property is only listed on public websites – This means your property is listed For Sale By Owner. Because you are listing a property by yourself on public websites such as Craigslist but not on the MLS, you won’t get the attention of buyers’ agents who represent over 90% of all buyers. Your property is only listed on the MLS – Many MLS systems will allow brokers to privately list a home for sale only on the MLS. This means only brokers will be able to see the listing, but the property won’t appear on any public websites. Your property is listed on neither the MLS nor public websites – This is typically called a pocket listing, which means your listing broker will rely entirely on email marketing to get the attention of direct buyers and buyers’ agents in their network. Selling a house privately by owner is never a good idea because you will miss out on the vast majority of home buyers who are represented by agents. Because your listing isn’t in the MLS, buyers’ agents generally won’t notice your listing. Remember that a MLS system is extremely powerful because it guarantees co-broking, otherwise known as the splitting of commission, between seller’s agents and buyer’s agents. A seller’s agent will typically secure a 6% commission from a seller through an Exclusive Right to Sell Listing Agreement which is then contractually split equally with buyers’ agents through the MLS. As a result, buyers’ agents rest easy knowing that they will get paid by showing a listing to their buyer client, and there’s never a need to ask about or haggle for their commission. If you decide to list your house privately by owner, you effectively miss out on the ability to co-broke with the buyer agent universe. Not a good idea if you’re trying to sell in a weak market! 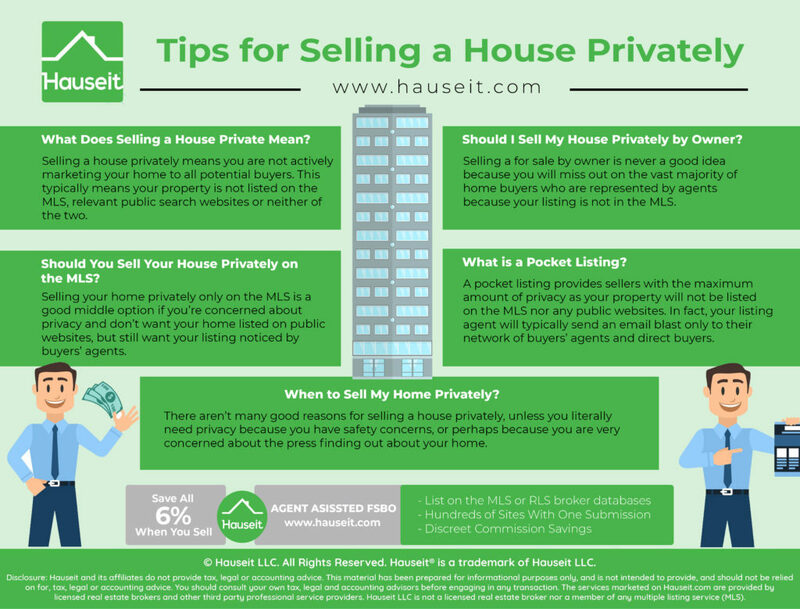 Selling your home privately only on the MLS is a good option if you’re concerned about privacy and don’t want your home listed on public websites. This is a good middle ground for someone who wants to sell their home privately, but doesn’t want to hurt their chances of finding a buyer too badly. However, you still won’t be getting maximum buyer exposure by default because your property won’t be listed everywhere. More importantly, the buyers you will miss will be direct buyers, who might help you save on commission significantly if you are utilizing an Agent Assisted FSBO or Full Service for 1% listing service. However, you’ll still have a shot of selling your place for full market value because 90% of buyers are represented by agents. Since your property will only be listed on the MLS, and thus viewable only by agents, at least you’ll get normal represented buyer exposure. Pro Tip: This is a good option for celebrities or other people who are concerned about their privacy, and do not want photos of their home posted publicly for tabloids to report on. Keep in mind however that quite a few people will still see your home because it’ll be visible to all real estate agents, and agents can easily leak news about your home sale to the press if you’re famous. A pocket listing provides sellers with the maximum amount of privacy as your property will not be listed on the MLS nor any public websites. In fact, your listing agent will typically send an email blast only to their network of buyers’ agents and direct buyers. To go one step further, a listing agent may only reach out to certain buyer agents and direct buyers whom they know will be able to afford the listing, or have clients who will be able to afford such a purchase. Even though you may hear breathless reports about the rise of pocket listings on the West Coast in heated property markets a few years ago, you should always think for yourself and decline to follow the herd when it comes to selling your house privately. Unless you are a celebrity or tycoon looking to sell a $100 million mansion or penthouse apartment in NYC, there’s absolutely no rationale for you to utilize a pocket listing. Furthermore, even if you are selling a $100 million apartment in Manhattan, having your famous name attached to the listing will draw free press and attention which will help you sell the apartment faster. Remember that being totally off market like this means you are missing out on virtually all buyers, and thus totally dependent on your listing agent’s personal network. No matter how connected your real estate listing agent may be, do you think he or she is as well connected as the internet? We don’t live in the 1980’s anymore. Use the internet. Don’t do a pocket listing. The primary risk to selling property privately is not being able to sell your property at all, or selling for a price that is substantially lower than its market value. The problem with selling a house privately is that your property is considered to be off market, and thus by default won’t receive full exposure to all potential buyers. If you don’t receive full marketing exposure, you’ll have less eyeballs, visitors and offers. You’ll have less competition between buyers and a lower sale price vs if you had marketed it fully. Another risk to selling property privately is that you’ll be targeted by vulture buyers who specifically look for properties that are off market or otherwise improperly marketed. These all cash buyers will wait as your days on market creeps up and as you become more desperate. Then, when you are ready to give up, they’ll come in with an all cash off that’s well below your asking price. What will you do then when you’re backed into a corner? Pro Tip: Read our authoritative guide to dealing with difficult home buyers to learn how to deal with vulture buyers, all cash buyers and other types of buyers in real estate in NYC. 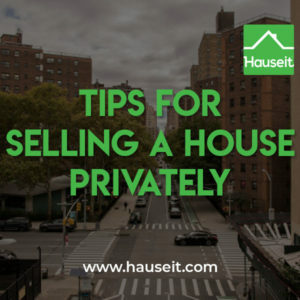 There aren’t many good reasons for selling a house privately, unless you literally need privacy because you have safety concerns, or perhaps because you are very concerned about the press finding out about your home. Or perhaps you simply don’t want the tabloids to print photos of the interior of your home. Other than that, there’s really isn’t a rationale even for the rich and famous to sell their home privately. If you are rich and famous and have a very expensive property, then it will be extremely tough to sell in the first place. As a result, you should try to get as much marketing exposure as possible for the unit, not less! For example, luxury properties in NYC which are typically considered to be $10 million or more take an extremely long time to sell, if they sell at all. In fact, it’s quite common to see luxury homes in NYC sit on the market for a year or more before they are either de-listed or sold. Pro Tip: Luxury homes are notoriously difficult to sell because the buyer base is much smaller vs your typical $2 million and under NYC property. Read our guide on how to sell luxury homes For Sale By Owner in NYC to learn how to do it yourself.